The suitcases come in the standard open end box with a photo of what they can look like once painted. Inside the box there is bubble wrap around a zip lock bag. The sample had no air bubbles, or damage,kind of hard to damage these unless you stomp on them or use a hammer. 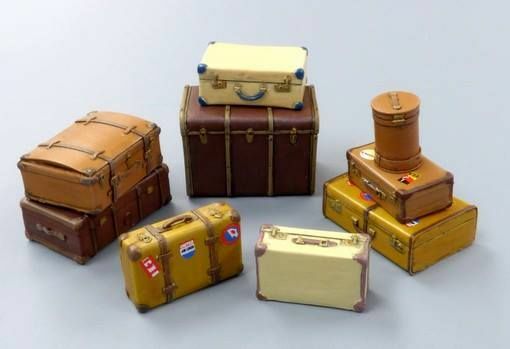 There are 7 suitcases and these are various types of suitcases which you can still find in use today on occasion or in your grandparents attic, 1 travel trunk and a ladies hat case. There is a pour stub on the lower back of each which needs to be removed and this saws off easily enough. The hard one was the travel trunk as the edges are curved, and through my own fault I was using a razor saw to keep the curve , and I didn't pay attention to the blade shape which resulted in one corner being cut off. Lucky for me it will be hidden by the other suitcases. They handles, straps and hinges are very well defined. When painted they will stand out nicely. Plus models also provides a sheet of travel decals that you see on many suitcases from movies and documentaries. They are from the following countries/cities; Canada, Berlin, Milano, Roma, Japan and United Airlines. A nice touch that will add a splash of color. Highs: A very good representation of time era suitcases. Handles etc. look great and the decals are a superb plus. Lows: The pour blocks interfere with straps but some T.L.C. and very fine Evergreen should take care of that. Verdict: A very useful set for dioramas or that different accessory for the outside of an A.F.V. The possibilities or endless and they will end up in a dio. I have been working on. Copyright ©2019 text by Bob Davis [ DIOMAN13 ]. Images also by copyright holder unless otherwise noted. Opinions expressed are those of the author(s) and not necessarily those of AeroScale. All rights reserved. Somewhat better copy of Plus Models advertising photograph as found online: Looks like a beautiful addition to their line.